I found out, that the new Bel-Ray SI-7 is made with a thinner mix. new formula mix, made for modern scooters now. I now use Bel-Ray 2T. The oil bottle on the right. I been using Bel-Ray 2T for a week now, testing it out. My sparkplug burn is back too normal, and the motor runs great, and starts better. I highly suggest, you stop using the new gray bottle oil on the left. 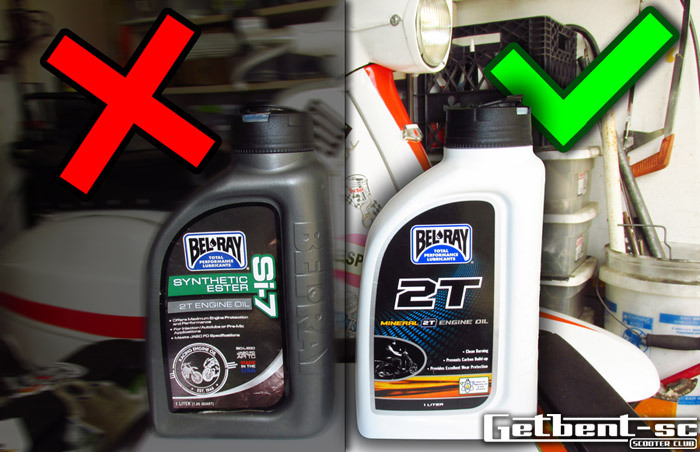 If you have the old Bel-Ray SI-7 in the white bottle, thats the good oil to use. Update from a customers October 1, 2015. Thanks for the note. (a) Do you recommend draining out the SI-7 and replacing with 2T; or should it be okay to mix them? I just bought another bottle of Si7 two weeks ago. 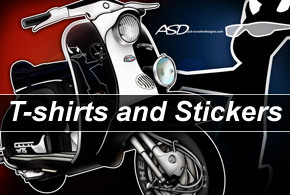 (b)The Vespa runs great; when I don't let the gas get too low or forget to turn off the fuel valve. I did a group ride Sunday and it ran great. ___and the scooter is running great, you should be okay. 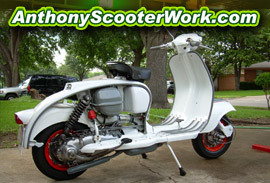 ________ that works good with vintage scooters, and the way we ride them. (A). When I made the oil change, I didnt drain the gas. ___I just mixed it right in, when my fuel got low. © Copyright 2015 GetBent-sc.com, All Rights Reserved.